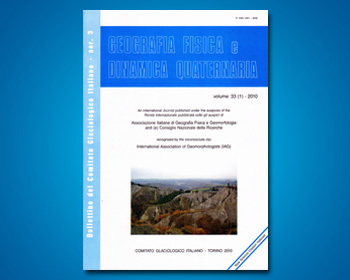 D’OREFICE M. & GRACIOTTI R.
This paper presents the results of a geological and geomorphological study carried out in the central-western area of the Carsoli basin (AQ) during the survey of the Geomorphological Sheet 367 «Tagliacozzo». The examined area belongs to a wide tectonic depression located at the point of contact between two different palaeogeographical domains that are separated by a tract of the «Olévano-Antrodoco» tectonic line. Mainly lacustrine deposits crop out inside this area. Above, these deposits are delimited by a large, ancient sub-horizontal erosional surface. At present, only some remnants of this surface remain between 620 m and 658 m above sea level. The surface, which slopes slightly towards NW, has been dissected by a drainage network laid out according to a sub-dendritic pattern, whose main stream channels have NW-SE and N-S preferential direction. Linear erosion, caused by the drainage network, has generated valleys and small valleys with steep slopes which are often subject to solifluction and little landslides. Of particular interest is the suffusion which gives rise to typical pseudo karstic forms along the valley incisions. Next to the Bosco di Oricola, a remarkable sequence of volcanic terrains of local origin, dated 0,531 My, overlies the lacustrine sediments disconformably. Three main pyroclastic formations have been distinguished: heterolitic breccias, grey tuffs, and reddish tuffs. Only the last two formations crop out widely. From the geomorphological point of view, the pyroclastic flow, made up of the unit of the grey tuffs that extends E-W between the Collina Rostere and the S.S. Tiburtina Valeria, is particularly important. The flow is formed by a channeled body inside a pre-existing small fluvial valley cut into the lacustrine deposits. The course of the palaeovalley, in which the pyroclastic flow is channeled, indicates an ancient E-W drainage direction that is completely different from the present situation. Over time, selective erosion has caused the relief inversion of the channeled pyroclastic body that is now a horizontal and tabular watershed. The overlying reddish tuffs are thicker and have a wider extension than the underlying grey tuffs. The tops of the small cone-shaped hills that characterize the area between the Bosco di Oricola and the southern carbonatic spurs are largely made up of these materials. They create a peculiar landscape characterized by small conic reliefs, elongated festoons and circular bastions of tuff. Fluvio-denudational and gravitative deposits crop out in some parts of the area in question. In conclusion, the existence of a local Middle Pleistocenic volcanism in this part of the Central Apennines has allowed for the acquisition of some useful morpho-stratigraphic, palaeogeographic, and palaeoenvironnemental information. This sector is a key area to be considered for a future morpho-evolutional reconstruction of the entire basin. However, considering the limited extension of the examined area, this goal can only be achieved following a careful geomorphological analysis of the whole Carsoli intermontane basin.